Following my post last month on the start of the “Coastal Walk from Porto to Santiago“, last Saturday, October 8th saw the second sector of the walk from Vila do Conde to Esposende. The organizers, Grupo Terra Verde, managed to rally a magnificent number of 98 participants for this sector of the walk stretching 25 kms and which promised a birds-eye view of not only Portuguese history but modern beachfronts and small, inaccessible market gardens, almost on the beach itself, that would produce wonderful arrays of vegetables! I was very much looking forward to this second part of the walk and in what had proved to be a very warm week weather-wise in Portugal, an early start at 07H30 was necessary to avoid the heat. The majority of the group were taken in large coach directly from Ermesinde (district of Porto) to Vila do Conde, where ‘Part One’ of the walk had finished last month. The balance of participants (which included myself and friends) were picked up from outside the magnificent FC Porto Estádio do Dragão in a smaller minibus. largest in the country and was nominated a national monument in 1910. On arrival at the centre of the city and with sunrise in full swing, we walked through the small side streets with beautiful old hand painted blue and white tiling on walls passing old monuments to reach the beautiful Vila do Conde Matriz Church (started in 1496). Here, in the square, we received final instructions from our Terra Verde organizers as well as have our ‘Credential de Pelegrino’ stamped at a quaint jewelry shop located close by to the church and square who dutifully opened up earlier than usual to perform this task. We also had an opportunity to visit the very beautiful Matriz Church which is filled with sacred art. For those who wished to have their ‘credential’ stamped by the church could also do so. Interestingly, on the Caminho de Santiago, not only do churches stamp a pilgrim’s credential along the way but also local shops which could be selling anything from bicycles to cakes, government institutions, etc. and therefore with only 40 places for these stamps means a credential will be quickly filled. 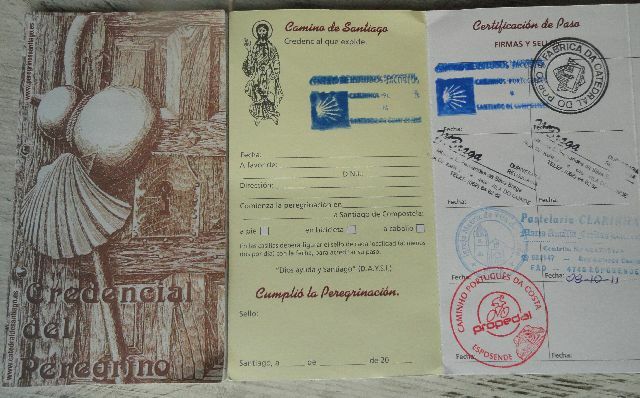 It is also interesting to note that all pilgrim routes throughout Europe for the Caminho walk through to Santiago should be marked with yellow arrows and in some cases one comes across the half scallop shell that is traditionally linked with the Santiago pilgrimage. Our organizers informed us however, that in some areas on our walk that day, that our path would be marked with red and white plastic tape tied to trees as it would appear that there is some rivalry between local parishes on which route should be taken through their village and therefore this was the best solution! Following this there was time for a quick espresso coffee and opportunity to try the local cake specialties which proved delicious! After a group photo we got away and as everyone’s walking pace set in the group began to stretch out over 1 km or so. gardens, simple fishing villages, selections of local produce of fruit and vegetables for sale, street flower sellers, an array of beautiful dogs and cats, traditional food stores, windmills, gardens, wonderful cake shops and so the list goes on. pastry shop which was established almost 60 years ago and is a favourite stop for all visitors to the area. We also crossed a beautiful river called the Cávado River which has its source in the mountain range of Serra do Larouco, in northeastern Spain, running through northern Portugal for 135 kms to its final destination of the Atlantic Ocean between Esposende and Fão. I would like to make a special mention here to the wonderful spirit of the local people whom we encountered along the way, either on foot or bicycles, and who couldn’t stop wishing us a ‘Bom Caminho’ (safe journey). With the large group that we were (98 in total), we obviously drew a huge amount of attention and it was very encouraging to have people say this to us. With the wonderful weather that there was, many people were out doing some form of exercise or just enjoying the sunshine and for some of the way on the beachfront at Povoa de Varzim, I had the pleasure of the company of one person for a good 15 minutes or so and whilst we walked , I heard all about the his home town and the walk to Santiago in general until we parted at traffic lights venturing off in our own directions! Finally in closing, we all finished in Esposende at around 18H30 in front of the main church and whilst waiting for the rest of the group we found yet another delicious pastry shop with an enormous selection of egg yolk based pastries and cakes which were irresistible. Whilst some of the group had their ‘credentials’ stamped at the bicycle store close by, others sinfully indulged in delicious local specialties. For those interested, a fellow blogger, Mirth & Motivation, kindly linked me to her review of a recently released film called “The Way” featuring the actor Martin Sheen in the lead role. My thanks to her for this, it looks well worth seeing especially for those who have done the walk! This entry was posted in History of Portugal, Minho, Walking in Portugal and tagged Minho Province, Pastry Shops, Photography, Portugal, Portuguese Food, Portuguese History, Rich Traditions, Santiago de Compostela, Way of St. James, WWWP5K. Bookmark the permalink. Yes, can’t wait to see the movie too! Its a great feeling to be walking and walking and just taking in all around you as you do this. Thank you for staying tuned. I unfortunately can’t do part 3 as I am away but will hopefully have permission from another walker from the Terra Verde Group to let me use their photos to show fellow readers of what it is like! Part 4 is in early December and then an olive oil route!